Sweet potato pie is my favorite holiday dessert! I remember making them the night before Thanksgiving with my mom. Being a sweet breakfast type of person, I love remaking healthier versions of my favorite desserts for breakfast. So, I decided to experiment one morning with a sweet potato pie oatmeal. Verdict: it tastes as sweet as pie! This will be on repeat for the winter months. Make a big batch and have some for the week! Pour 1 cup water into the inner pot of a pressure cooker. Place the steamer basket into the inner pot. Mix oats, 1½ cups water, coconut cream, sweet potato purée, coconut sugar, vanilla extract, pumpkin pie spice, and salt together in a 7-cup heat-proof bowl. Place bowl on top of the steamer basket. Lock pressure cooker lid in place and set steam vent to Sealing. Set steam vent handle to Venting to quick-release pressure. Carefully remove the bowl. 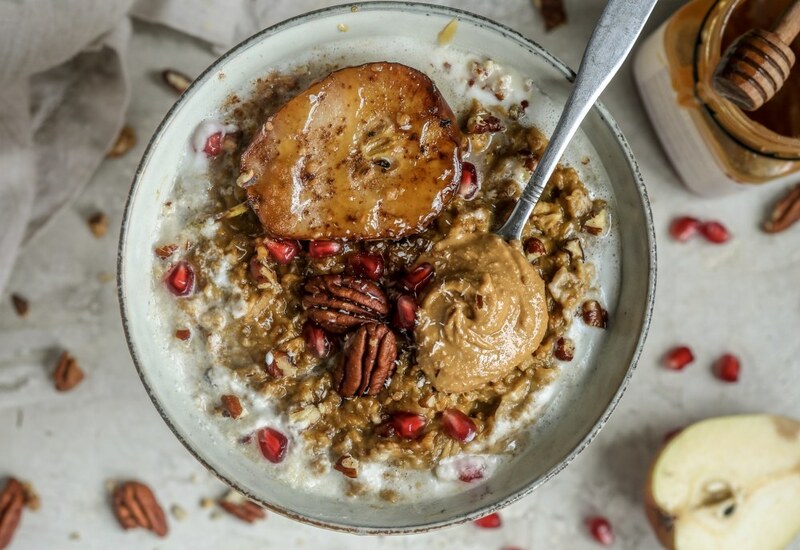 Serve oatmeal with pecans, seasonal fruit, honey, and nut butter if you wish! Sub coconut sugar with maple syrup. Add ground flax for an extra boost of fiber. If you follow a gluten-free diet, look for gluten-free oats at your local grocery store and this meal can be a gluten-free meal. Per Serving: 364 calories; 10g fat; 65.7g carbohydrates; 5g protein; 0mg cholesterol; 119mg sodium.